Despite some valiant performances against first division opposition (and less valiant against third division teams) there now remain only eight representatives of the second division in this year's league cup. In terms of predictions I fared OK with 9 out of 13 and to follow the line from Charlton to Yeovil to Middlesbrough who take over the baton there - no doubt to lose in the next round. So good luck to Burnley, Derby, Ipswich (thanks to a goal by Super Kevin Lisbie), QPR, Reading, Sheffield United, Southampton and Watford in the next round. 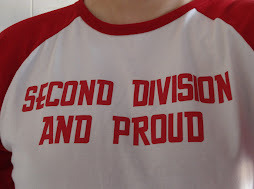 Remember it's not just your club you're representing but the proud old second division ... up and at em boys!! !